The piece “No to tax holiday for mining investors, civil society urges: Malawi’s royalty rate on higher side – Industry expert” featured below was initially published in Malawi’s Mining Review Issue Number 27 2015 that is circulating this July 2015. The report that the article refers to is available here. Civil Society groups have urged government to refrain from giving tax holidays and other incentives to mining investors in order to ensure that Malawi, which is one of the poorest countries in the world, adequately benefits from mining projects. 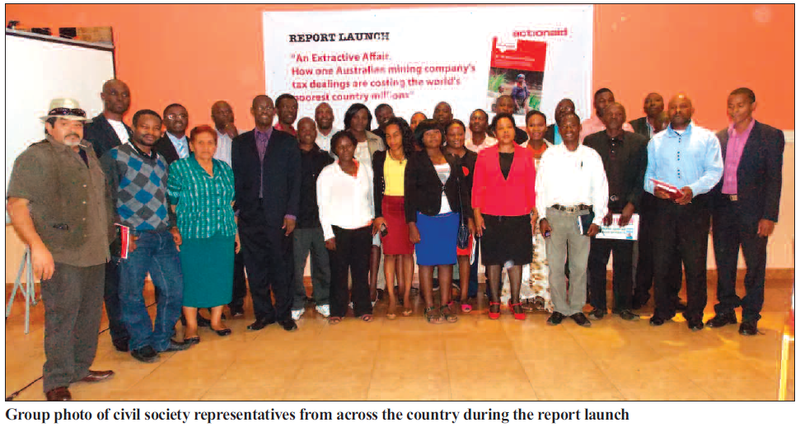 Leaders of various civil society groups made the call to government at the launching ceremony of a report by British Charity ActionAid critiquing Malawi Government’s tax dealings with Australian miner Paladin on the Kayelekera Uranium mine in Karonga, which is Malawi’s largest mining investment. The report says Malawi has lost US$43.16-million of tax revenue over a six year period starting from Paladin’s launch of mining operations in 2009 to 2014 when the mine went on care and maintenance as the company was failing to make profits because of a decline in cost of uranium on the world market. Uranium prices dramatically fell on the world market in the aftermath of the Fukushima Nuclear Disaster in Japan which led to the closure of many nuclear plants in Asia thereby having a knock on effect on the global demand for the yellow cake. In the report, ActionAid says there were no illegal dealings by Paladin despite that in addition to enjoying the tax incentives granted by the Malawi government, the company took advantage of an international taxation treaty that Malawi signed with the Netherlands, where the dual listed firm has a subsidiary, in order to enjoy tax breaks. The Kayelekera Development agreement that Malawi signed with Paladin Africa in 2009 granted the Malawi Government 15% shares in the mine in exchange for a reduction of royalties from the 5% stipulated in the taxation law to 3%. ActionAid says Malawi would have adequately benefitted from the mine during this production period if the deal had maintained the royalties at 5%. The NGO also critiques the Malawi Government for including a 10-year stability clause which implies that the deal cannot be altered during that given period saying its neighbor Zambia has recently broken some of these clauses in existing agreements. It says Malawi, whose mining industry is in its infancy, should take the mistakes it made in the Paladin deal as a lesson as it negotiates with various companies to explore for oil and gas and different minerals. Malawi cannot afford to repeat previous mistakes and must ensure it makes the most of its natural resources to maximize the revenue it gets from them in order to fund its national development plan. This means ensuring that it does not give large-scale harmful incentives to multinational companies exploring oil and gas or any other natural resource in Malawi. In particular, it should ensure it gets decent royalty rates for the one-off selling of its precious natural resources. Malawi must also do its utmost to ensure that companies pay taxes in Malawi even if they shift funds out of the country. This means ensuring that its own network of tax treaties minimizes opportunities for companies to shift profits out of Malawi without paying withholding taxes. ActionAid’s report follows an earlier report by CCJP that also alleged similar accounting flaws on Paladin’s operations in Malawi and shortfalls in the deal signed between the dual listed miner and the Malawi Government. In his response, Paladin General Manager for International Affairs, Greg Walker, disputes claims by the NGOs on transfer pricing saying Paladin’s annual financial statements are prepared in accordance with Malawi and international accounting principles and are approved by the board of Paladin on which the Malawi Government is represented. He says the Malawi Government as a shareholder can analyse Paladin’s accounts and interrogate Paladin management if it has any queries concerning the accounts. Paladin accounts are audited by independent accounting firm, Ernst & Young Malawi Limited which is a member firm of Ernst and Young Global Limited, a global leader in assurance, tax, transactions and corporate advisory services. On the royalty rate, Walker says at 3% Kayelekera’s royalty rate is not unusually low as it is the same as Namibia’s for uranium adding that the average royalty rate in Africa including neighbouring Southern Africa Development Community (Sadc) countries is 3% of sales value. Acting Director for Mines Department, Mr. Peter Chilumanga, comments that as Malawi is in the process of formulating a new Mines and Minerals Act, all the oncoming deals with mining investors will be formulated in accordance with the new law and the Taxation Act to erode all suspicions by Malawians. State President Professor Arthur Peter Mutharika also highlighted the wish for his government to subscribe to the Extractive Industry Transparency Initiative (EITI) to ensure that there is transparency in scratching out any mining deals.